You can only control 1 “Yuki-Onna, the Ice Mayakashi”. While this card points to a Synchro Monster(s), your opponent’s monsters cannot target this card for attacks. If a Synchro Monster(s) in your possession is destroyed by battle or an opponent’s card effect while this card is on the field: You can target 1 face-up monster on the field; its ATK/DEF becomes half its current ATK/DEF until the end of this turn. You can only use this effect of “Yuki-Onna, the Ice Mayakashi” once per turn. Yuki-Onna, the Ice Mayakashi is the archetype-specific Link monster, and a defensive monster for the smaller Mayakashi monsters. Two Mayakashi monsters is easy to come by off of Hajun’s Normal or Special Summon, and she can open up your zones for more Synchro Summoning all the while getting around the Mayakashi locked-in restriction. If your opponent destroys a Synchro of yours while Yuki is on the field she’ll Shrink a monster until the end of the turn. This is a handy stall tactic, forcing your opponent to get rid of Yuki if they don’t have the firepower to deal with a Shrink. It would have been a better effect if she would have been able to Shrink a monster during the Battle Phase if you only controlled Mayakashi monsters or something like that. Regardless, it’s a good defensive effect that can stall your opponent and protect your lower ATK monsters that this archetype has outside their Synchro monsters. Hey everyone, sorry I’ve been dodging the draft this week. I’m glad I get to start with the Extra Deck Mayakashi. Yuki-Onna, the Ice Mayakashi is a Link 2 Water Zombie-type Link Monster with 1900 Atk and with Bottom Left and Bottom Right Arrows. She requires any 2 Mayakashi monsters to properly Link Summon. The requirements makes sense since most Mayakashi monsters restrict Extra Deck summoning to Mayakashi monsters. Also, the main deck Mayakashi monsters are relatively weak so 1900 Atk is something they look up to even if it would only be average anywhere else. For the rest of the stats, being different attributes can be a problem for the archetype as a whole when your opponent sides their trap card. The meat of the effect is that if Yuki-Onna points to any Synchro monster, she cannot be targeted by effects. A little selfish defense is cool but not great. Her second effect triggers when a Synchro monster is destroyed by the opponent. You get to halve the Atk of one of their targeted face-up monsters. That effect is once per turn for some reason. It doesn’t really do anything. While Synchro Monsters are everywhere in the deck, you won’t always have one on the field, making Yuki have no effects and only 1900 Atk. She doesn’t even help you Synchro climb, by reviving, Special summoning, or even adding to the hand. It doesn’t really matter that there can only be one of her on the field at a time because her arrows don’t work in the Main Monster Zone, and her effects are too defensive to even want more than one on the field. We looked at the two most important Main Deck monsters and now we go into the Extra Deck to look at their Link Monster: Yuki-Onna, the Ice Mayakashi. Yuki-Onna is a Link-2 WATER Zombie with 1900 ATK and arrows pointing Bottom Left and Bottom Right. 1900 ATK works for me on a Link-2, Zombie is once again great, WATER is fine but not the best when it doesn’t work with other WATER monsters, and arrows are what you want on any Link-2 really. The summoning requirements are 2 Mayakashi monsters, which is very simple to achieve. You can only control 1 Yuki-Onna, though once you get this in the Extra Monster Zone I wouldn’t think you’d want another in the Main Monster Zone since it doesn’t really benefit from being there. While this card points to a Synchro Monster, your opponent cannot target this card for attacks, and most of the Synchros have better ATK than 1900, so they have to go through that to get to this. If a Synchro monster in your possession is destroyed by battle or an opponent’s card effect while this card is face-up on the field, you can target 1 face-up monster on the field and half its ATK and DEF for the turn and this is a hard once per turn effect. So if your opponent gets over one of your Mayakashi Synchros, you can weaken one of their monsters so they can’t get over another one, and since the Mayakashi Synchro was destroyed, you can likely revive a lower level one and get an effect. I mention Mayakashi Synchros mostly because those are likely the only Synchros you use with this considering the Main Deck Mayakashi are very limiting on your Extra Deck options. Yuki-Onna is good to go for if you can summon this and do your Synchro Climbing, cause you don’t really want this alone on the field with the Dakki you’re likely reviving, even if it is just to get it destroyed and let the Level 11 revive itself. Yuki-Onna is just a good option if you can make an extra play beyond the Synchro climbing, but you can do that often enough to warrant two of your Extra Deck spots to this. Art: 4.25/5 Very chilly she seems to be. 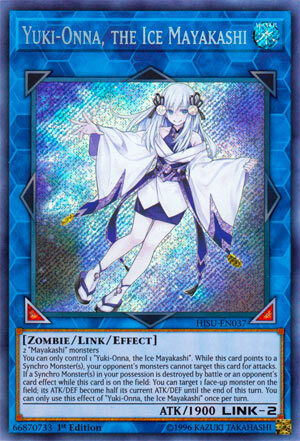 Yoko Ohno (couldn’t resist) erm Yuki-Onna, the Ice Mayakashi is a Link 2 Monster of the Water (appropriately) attribute, thought my comment about all these differing attributes remains in play, who simply requires two Monsters within the theme for a Link Summon. She has 1900 attack, which is respectable enough for a Link 2, with arrows pointing to the respective bottom diagonals. Anyway, we’ve heard this week too before and here we are again that you can only control one Yuki-Onna at a time. If pointing to a Synchro Monster(s), your opponent can’t attack this card. Useful enough, and any protection is welcome. With 1900 attack, she’s no pushover, but she’s not a force of her own, either, so I like that effect, and the ease you should be able to use it. Next, if a Synchro Monster is destroyed via Battle or opponent’s Card Effect (versatility is always welcome in destruction effects) you can select and halve the attack and defense of a Monster on the Field until the end of the turn. So, if only one Synchro was Linked and protecting this, likely that Monster won’t be able to destroy this card (save it has more than 3800 attack at the time). Naturally, this is a once per turn thing, but it offers protection in itself too. She’s definitely more defensively minded than offensive, but the defense aspects of this card can be used in and for offensive manners as well. She’s still good, not as essentially or useful as the two prior cards this week, but still a pretty useful cog in the archtype as a whole I feel. Art: 5/5 She looks the most like her Japanese companion of lore, I love how astute some of the parallels actually are (especially here) and she cold almost pass for a Zombie with the white skin and clothes…great use of background color here too.